Dominion KX III (Dominion KX3) is a digital KVM-over-IP switch with an advanced hardware engine and software architecture that provides the industry's highest performance, 30 frames-per-second video-over-IP, along with ultimate reliability, usability, compatibility and security. Dominion KX III provides 1, 2, 4 or 8 users with BIOS-level remote management of 8, 16, 32 or 64 servers in a single switch. With industry leading video performance, security, enhanced reliability and standard features such as DVI/HDMI/DisplayPort digital video, VGA analog video, audio, virtual media, smart card/CAC, and mobile access, Dominion KX III is suitable for both general applications and dynamic broadcast applications. Dominion KX3 is completely hardware- and OS-independent; users can troubleshoot and reconfigure servers even when servers are down. Featuring a modern hardware design with increased computing power and storage, Dominion KX III provides KVM-over-IP access for IT administration, as well as high performance IP access for broadcast applications. Dominion KX III comes with standard features such as DVI/HDMI/DisplayPort digital and analog video, audio, virtual media, smart card/CAC, blade server support, and mobile access. 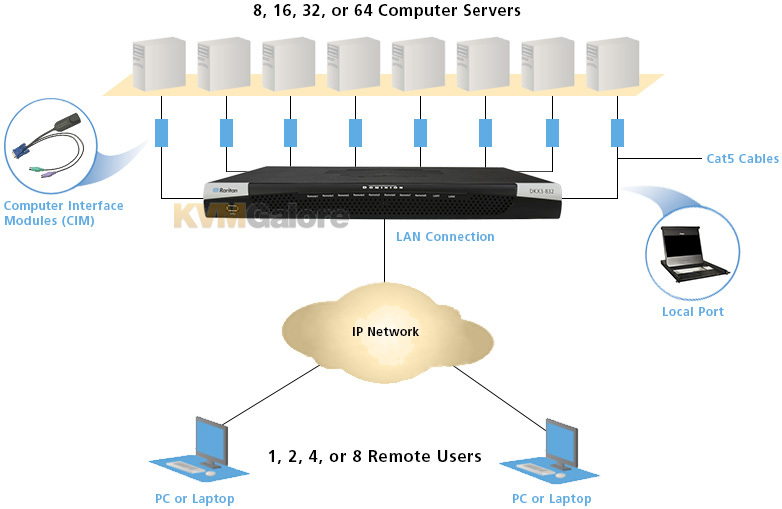 All Dominion KX3 models feature a tiering port to connect multiple Dominion KX III switches together and access the attached servers. Up to 1024 servers can be accessed via a consolidated port list. 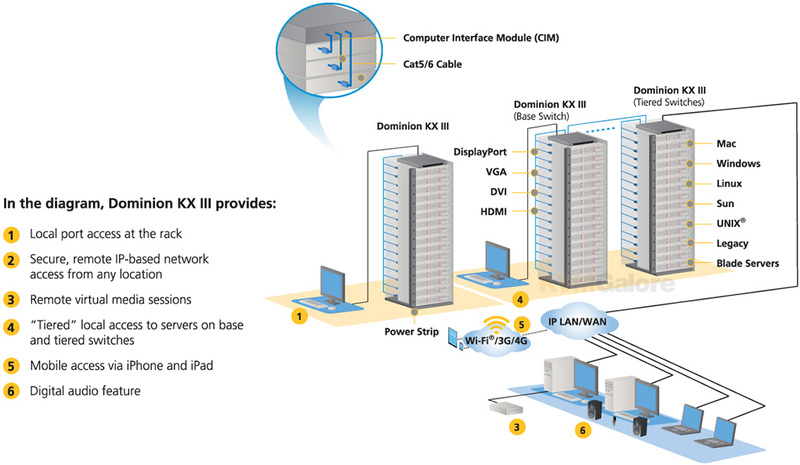 Dominion KX III includes the features needed to eliminate trips to the data center. Raritan's Universal Virtual Media lets administrators remotely perform tasks such as installing software, transferring files and backing up data. Customers can control and manage servers on-the-go via their Apple iPhones and iPads, through Raritan's CommandCenter Secure Gateway. Dominion KX III provides high performance KVM-over-IP access for broadcast, entertainment and other dynamic applications requiring high speed video quality and response anytime/anywhere. Dominion KX III's next generation video processing engine supports a broad range of applications, from traditional computer applications to the most dynamic broadcast applications that require 1920x1080 resolution, 24 bit color, digital audio, dual monitors and DVI, HDMI, DisplayPort and VGA video. View streaming 1080p video at 30 frames per second over your LAN! Raritan's KVM-over-IP products meet U.S. and Canadian government security mandates and are widely used by military and government agencies. As the most secure KVM-over-IP switch, Dominion KX III includes a FIPS 140-2 certified cryptographic module, smart-card/CAC authentication, and IPv6. 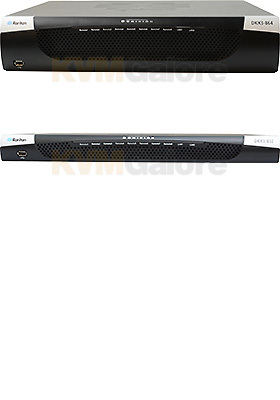 And with dual power supplies and dual gigabit Ethernet ports, the Dominion KX III is the most reliable and secure digital KVM switch in the industry. Dominion KX III is ideal for server rooms, test labs, studios, branch offices to the largest enterprise data centers. Dominion KX III offers high performance, Java-free, web-based remote management of servers, PCs, workstations, laptops and serial devices with virtually any application. Deploy individually, or centralize with Raritan's CommandCenter Secure Gateway.